Suresh Bhatia received a B.Tech. degree in Chemical Engineering from the Indian Institute of Technology, Kanpur, and Master’s as well as PhD degrees from the University of Pennsylvania. He worked for a few years in industry in the USA, and for two years at the University of Florida, before joining the Indian Institute of Technology, Mumbai, in 1984, and subsequently The University of Queensland in 1996. 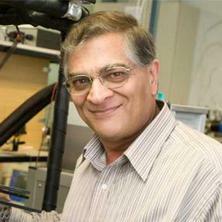 His main research interests are in adsorption and transport in nanoporous materials and in heterogeneous reaction engineering, where he has authored over two hundred and ten scientific papers in leading international journals. He has received numerous awards for his research, including the Shanti Swarup Bhatnagar Prize for Engineering Sciences from the Government of India, and the ExxonMobil Award for excellence from the Institution of Chemical Engineers. Since January 2010 he holds an Australian Professorial Fellowship from the Australian Research Council. He is a Fellow of two major academies – the Australian Academy of Technological Sciences and Engineering, and the Indian Academy of Sciences ‑and of the Institution of Chemical Engineers. He is the Regional Editor of the international journal Molecular Simulation. He has held visiting positions at leading universities, and between 2007 and 2009 he was the Head of the Division of Chemical Engineering at UQ. Bhatia’s current research centers around three principal themes. One of these is on transport in nanopores and nanoporous materials, where he is developing practical models of transport in nanoporous materials in conjunction with simulation and experiment. Among the recent achievements is a new theory of diffusion in nanoscale pores, which supersedes the century long Knudsen model, and which has been extended to disordered materials. A current focus of the research is the description of fluid-solid friction and of fluid phase shear stress at the nanoscale, for which existing theories based on bulk phase behavior are inadequate. The results will have importance for the modelling of transport in nanomaterials and membrane-based separations. In another stream of activity he is developing atomistic models of disordered carbons using hybrid reverse Monte Carlo simulation methods, in conjunction with neutron scattering experiments. These atomistic models are then used to investigate the adsorption and transport of adsorbed fluids in the carbon nanostructure for a variety of applications. Among the carbons being examined are carbide-derived carbon based adsorbents for carbon dioxide capture from moist gases and CH4/CO2 separations. The co-adsorption of water has critical influence in these applications, and strategies for mitigating this influence are being experimentally investigated. This is supported by molecular dynamics simulations which are being used to achieve new understanding of the adsorption and transport of water in disordered carbons and carbon nanotubes. A third area of recent activity is the study of carbon supercapacitors, where he is developing advanced simulation-based models for the equilibrium and flow of ions in porous carbon electrodes. These models will enable the optimisation of carbon structure for maximising capacitance, and enhancing charging/discharging rates. Bhatia has teaching interests in chemical reaction engineering, and applied mathematics, both at the undergraduate and postgraduate levels. Dynamics of mixture adsorption in nanoporous materials. This project focuses on understanding the diffusion of gases in nanoporous materials, which is challenging both from a fundamental and applications viewpoint. In this connection we have already performed molecular dynamics studies with single component systems, and developed a novel new theory of diffusion and transport of adsorbates in such materials. The new studies now proposed focus on binary systems, and the new theory developed will be extended to multicomponent systems in conjunction with molecular dynamics simulation and experiments. Synthesis and modelling of mixed matrix membranes. Mixed matrix membranes comprising a zeolite or other suitable adsorbent dispersed within and polymer matrix are attracting considerable attention because they combine the good mechanical properties of the polymer matrix with separation properties of the adsorbent. Here, we will synthesis suitable mixed matrix membranes for CO2/CH4 and H2/CO2 separation, and investigate their transport properties in this application. Mathematical model of the diffusion through the membrane will be developed and validated against experimental data. Modelling of electrochemical supercapacitors. Nanoporous carbons have important uses in electrolytic supercapacitors; however the understanding of their behaviour in this application is still not well developed and process models are very primitive. This project will investigate electrolyte behaviour in disordered carbons using molecular simulations as well as experiments, and develop strategies for optimising supercapacitor behaviour. Tailoring or carbide derived carbons for CO2 capture. Carbide derived carbons are a novel class of nanoporous carbons, synthesised by chlorination of a metal carbide, and are considered useful in gas storage and separation. Here we will explore novel strategies for tailoring their structure for CO2 capture from flue gas. The project will combine experiments and modelling of the adsorption. Atomistic modelling of disordered carbon structure. Nanoporous carbons in industrial use are inherently disordered, and have a complex structure. While idealized slit pore models can often be adequate in predicting their adsorption properties, and are commonly used, successful prediction of fluid transport in such carbons requires more detailed representation of the structural complexity. In this project we will use reverse Monte Carlo simulation methods to determine the structure at an atomistic level, and utilize this structure as a platform to predict adsorption and transport properties. This will enable better prediction of process behavior, and improved process design and optimization of separation and storage processes using such carbons. Separation of light isotopes using quantum molecular sieving. We have demonstrated both theoretically and experimentally, that at low temperatures heavier isotopes can diffuse faster than lighter ones in nanoporous materials due to quantum effects. This suggests the possibility of molecular sieving of isotopes at low temperature. Here we shall investigate this novel behaviour theoretically for He3/He4separation using nanoporous graphene membranes. The project will utilise Monte Carlo and molecular dynamics simulations in investigating the adsorption and transport of these isotopes and their mixtures. Nguyen, Thanh X. and Bhatia, S. (2008). Characterization of nanoporous carbons using density functional theory. In Terzyk, A.P., Gauden, P.A. and Kowalczyk, P. (Ed. ), Carbon Materials: Theory and Practice (pp. 453-478) India: Research Signpost. Kowalczyk, P. and Bhatia, S. (2008). Nanoporous carbonaceous materials - efficient vessels for on-board storage of methane and hythane fuel. In Terzyk, A.P., Gauden, P.A. and Kowalczyk, P. (Ed. ), Carbon Materials: Theory and Practice (pp. 495-516) India: Research Signpost. Bhatia, Suresh K. (2017) POWER GENERATION THROUGH IN SITU COAL GASIFICATION: A PILOT PLANT DESIGN FOR THE LINKED VERTICAL WELLS PROCESS. , 497-506. Is kinetic molecular sieving of hydrogen isotopes feasible? Single-walled carbon nanotubes: Efficient nanomaterials for separation and on-board vehicle storage of hydrogen and methane mixture at room temperature? Nguyen, T.X. and Bhatia, S. (2007) Characterization of nanoporous carbons. Studies in Surface Science and Catalysis, 160 63-70. Kurniawan, Y., Bhatia, S. K. and Rudolph, V. (2005) Monte Carlo Simulation of Binary Mixture Adsorption of Methane and Carbon Dioxide in Carbon Slit Pores. Annales Universitatis Mariae Curie-Sklodowska. Sectio AA, Chemia, LX 6: 79-92. Cheng, Z-M., Yuan, W-K. and Bhatia, S. K. (2003) Unconventional Operation of Three-Phase Fixed-Bed Reactors: A Perspective Trend in Reaction Engineering. Trends in Chemical Engineering, 8 35-59. Nguyen, T., Bhatia, S. and Nicholson, D. (2002) Packing Transitions of Lennard Jones fluids in carbon slit pores. Annales Universitatis Marie-Curie Sklodowska, 7 158-177. Ismadji, S. and Bhatia, S. (2002) Percolation Phenomena in Micropore Adsorption: Influence on Single and Multicomponent Adsorption Equilibria. Studies in Science and Catalysis 144, 144 123-130. Sonwane, C. G. and Bhatia, S. K. (2000) Characterization of pore size distributions of mesoporous materials from adsorption isotherms. Journal of Physical Chemistry B, 104 39: 9099-9190. Bhatia, S. K. and Sonwane, C. G. (2000) Adsorption hysteresis and criticality in regular mesoporous materials. Studies in Surface Science and Catalysis, 128 187-196. Sonwane, C. G., McLennan, A. D. and Bhatia, S. K. (2000) Comprehensive structural characterization of MCM-41: From mesopores to particles. Studies in Surface Science and Catalysis, 128 197-205. BHATIA, SK and GUPTA, JS (1992) MATHEMATICAL-MODELING OF GAS-SOLID REACTIONS - EFFECT OF PORE STRUCTURE. Reviews in Chemical Engineering, 8 3-4: 177-258. JAIN, S, LALA, AK, BHATIA, SK and KUDCHADKER, AP (1992) MODELING OF HYDROLYSIS CONTROLLED ANAEROBIC-DIGESTION. Journal of Chemical Technology and Biotechnology, 53 4: 337-344. BHATIA, SK (1985) ON THE PSEUDO STEADY-STATE HYPOTHESIS FOR FLUID SOLID REACTIONS. Chemical Engineering Science, 40 5: 868-872. Bhatia, S. K. and Gao, X. (2013). Effective medium theory-based modelling of transport in disordered nanoporous membranes. In: Separations Division 2013 - Core Programming Area at the 2013 AIChE Annual Meeting: Global Challenges for Engineering a Sustainable Future. Separations Division 2013 - Core Programming Area at the 2013 AIChE Annual Meeting: Global Challenges for Engineering a Sustainable Future, San Francisco CA, United States, (523-523). 3-8 November 2013. Bhatia, S. K. and Nguyen, T. X. (2012). Mechanism of water adsorption in hydrophobic nanospaces of disordered carbons. In: AIChE 2012 - 2012 AIChE Annual Meeting, Conference Proceedings. AIChE Annual Meeting, AIChE 2012, Pittsburgh, PA United States, (). 28 October - 2 November 2012. Bhatia, Suresh Kumar (2009). Pore accessibility in disordered nanoporous materials: Experiment, theory and simulation. In: , , (). .
Bhatia, S. K. (2009). Adsorptive storage of hydrogen in nanoporous materials. In: Abstracts of scientific papers, 237th American Chemical Society national meeting and exposition. 237th National Meeting and Exposition of the American Chemical Society, ACS 2009, Salt Lake City, UT, (). 22 - 26 March 2009. Nguyen, T. X., Cohaut, N., Bhatia, S. K. and Bae, J.-S. (2009). Characterisation of microporous carbons: From mathematical modeling to atomistic construction. In: Kaskel, S., Proceedings of the 8th International Symposium on the Characterisation of Porous Solids. Characterisation of Porous Solids VIII, Edinburgh, UK, (48-55). 10-13 June 2008. Bae, Jun-Seok, Bhatia, Suresh K., Massarotto, Paul, Rudolph, Victor and Shin, Choon Hwan (2009). Gas adsorption measurement on coals for CO2-ECBM. In: Fu Xuehai, Qin Yong, Geoff G. X. Wang, Wei Zhongtao, Victor Rudolph, Zhao Qingbo and Ye Jianping, Proceedings of 2009 Asia Pacific Coalbed Methane Symposium and 2009 China Coalbed Symposium. 2009 Asia Pacific Coalbed Methane Symposium and 2009 China Coalbed Symposium, Xuzhou, Jiangsu, China, (704-711). 24-26 September 2009. Nguyen, T. X., Cahout, N., Bae, J.-S. and Bhatia, S. K. (2009). New method for atomistic construction of porous carbons using HRMC simulation. In: N. Seaton, F. R. Reinoso, P. Llewellyn and S. Kaskell, Characterisation of Porous Solids VIII: Proceedings of the The 8th International Symposium on the Characterisation of Porous Solids. COPS VIII conference, The University of Edinburgh, United Kingdom, (). 10-13 June, 2008. Nguyen, T. X. and Bhatia, S. K. (2009). Pore accessibility in nanoporous carbons: Experiment, theory and simulation. In: Kaskel, S., Proceedings of the 8th International Symposium on the Characterisation of Porous Solids. Characterisation of Porous Solids VIII, Edinburgh, UK, (1-8). 10-13 June 2008. Bhatia, Suresh K. (2008). Modeling mixture transport in nanopores: Departure from existing paradigms. In: AIChE100 - 2008 AIChE Annual Meeting, Conference Proceedings. 2008 AIChE Annual Meeting, AIChE 100, , , (). November 16, 2008-November 21, 2008. Pearce, David, Pattabathula, Venkat, Bhatia, Suresh, Iob, Massimo and Richardson, Jim (2008). Failure and replacement of ammonia converter baskets and application of AmoMax catalyst. In: AIChE Technical Manual 2008: Safety in Ammonia Plants and Related Facilities Symposium. Proceedings. 53rd AIChE Safety in Ammonia Plants and Related Facilities Symposium, San Antonio, TX, USA, (265-278). 7-11 September, 2008. Bae, J.-S., Bhatia, S. K., Massarotto, P., Rudolph, V. and Shin, C-H. (2008). Open hysteresis phenomena in high-pressure sorption of methane and carbon dioxide on coal. In: P. Massarotto, S. D. Golding, X. Fu, C. Wei, G. W. Wang and V. Rudolph, Asia pacific coalbed methane symposium, Brisbane Australia, (). 22-24 September, 2008. Nguyen, Thanh X., Bae, Jun-Seok and Bhatia, Suresh K. (2007). Determination of pore accessibility of nanoporous carbons using transition state theory. In: 9th International conference on fundamentals of adsorption, Sicily, Italy, (). 20-25 May, 2007. Nguyen, T. X. and Bhatia, S. K. (2006). Characterization of nanoporous carbons. In: Llewellyn, PL, Rodriquez Reinoso, F, Rouqerol, J and Seaton, N, 7th International Symposium on the Characterisation of Porous Solids, Aix-en-Provence France, (63-70). May 25-28, 2005. Nguyen T.X. and Bhatia S.K. (2006). Molecular dynamics simulation of simple gases in various porous structure models. In: 2006 AIChE Annual Meeting. 2006 AIChE Annual Meeting, San Francisco, CA, (). November 12, 2006-November 17, 2006. Bhatia, S. (2005). Kinetic Study on the thermal degration of high density polyethylene. In: Dr Matt Hardin, 33rd Australasian Chemical Engineering Conference. CHEMECA, Brisbane, Queensland, Australia, (1-5). 25-28 September 2005. Bhatia, S. (2005). Transport in nanostructured materials: New understanding through theory and simulation. In: Dr Matt Hardin, 33rd Australasian Chemical Engineering Conference. CHEMECA, Brisbane, Queensland, Australia, (1-6). 25-28 September 2005. Bhatia, S. and Nicholson, D. (2003). Computer simulation of transport in cylindrical mesopores. In: C-H Lee, Proceedings of the Third Pacific Basin Conference on Adsorption Science and Technology. Proceedings of the Third Pacific Basin Conference on Adsorption Science and Technology, Korea, (104-108). 25-29 May 2003. Sonwane, C. and Bhatia, S. K. (2002). Determination of Pore Size Distributions of Mesoporous Materials from Adsorption Isotherms. In: K. Kaneko, H. Kanoh and Y. Hanzawa, 7th International Conference on Fundamentals of Adsorption. 7th International Conference on Fundamentals of Adsorption, Japan, (999-1006). May 20-25 2001. Ismadji, S. and Bhatia, S. K. (2002). Percolation phenomena in micropore adsorption: Influence on single and multicomponent adsorption equilibria. In: , , (123-130). .
Feng, B., Bhatia, S. and Barry, J. C. (2001). Catalysed Structural Ordering of Coal Char during Heat Treatment. In: Prof. D.G. Wood, 6th World Congress of Chemical Engineering. 6th World Congress of Chemical Engineering, Melbourne, (). 23-27 September. Ismadji, S. and Bhatia, S. (2001). Determination of Pore Size Distribution of Activated Carbon from Liquid Phase Adsorption Isotherms. In: Prof. D.G. Wood, 6th World Congress of Chemical Engineering. 6th World Congress of Chemical Engineering, Melbourne, (). 23-27 September. Feng, B., Bhatia, S. and Barry, J. C. (2001). Structural ordering of coal char during heat treatment and its impact on reactivity. In: Proceedings of the Carbon 01 in Lexington, Kentucky. Carbon 01, Lexington, Kentucky, (). 14-19 July, 2001. Bhatia, S.K. and Sonwane, C.G. (2000). Adsorption hysteresis and criticality in regular mesoporous materials. In: K.K. Unger, G. Kreysa and J. P. Baselt, Characterization of Porous Solids V : Proceedings of the Fifth IUPAC Symposium on Characterisation of Porous Solids. Fifth IUPAC Symposium, Heidelberg, Germany, (187-196). 30 May-2 June, 1999. Barry, J. C., Bhatia, S. and Feng, B. (2000). Catalytic graphitisation of coal char during heat treatment. In: Proceedings of the 9th Australian Coal Science Conference. 9th Australian Coal Science Conference, Brisbane, (). Nov. 26-29, 2000. Sonwane, C.G., McLennan, A.D. and Bhatia, S.K. (2000). Comprehensive structural characterization of MCM-41: From mesopores to particles. In: Klaus K. Unge, Gerhard Kreysa and J. P. Baselt, Characterisation of porous solids V: Proceedings of the Fifth IUPAC Symposium on Characterization of Porous Solids. Fifth IUPAC Symposium, Heidelberg, Germany, (197-205). 30 May-2 June, 1999. Feng, Bo and Bhatia, Suresh K. (2000). Percolative Fragmentation of Coal Char during Gasification. In: B. Feng and S. Bhatia, Proceedings of the The Nineth Australian Coal Science Conference. The Nineth Australian Coal Science Conference, Brisbane, Australia, (). 26-29 November, 2000. Bhatia, S. (1999). A new model for reactivity of carbons. In: 24th Biennial Conference on Carbon. 24th Biennial Conference on Carbon, Charleston, USA, (). 10-16 July. Feng, B. and Bhatia, S. K. (1999). Variation of electrical resistivity of coal chars during gasification. In: 24th Biennial Conference on Carbon. , Charleston, USA, (228-229). 10-16 July. A Model for Adsorption of Condensable Vapors on Nonporous Materials (2000) . Edited by Bhatia, S. and Sonwane, C.. Second Pacific Basin Conference on Adsorption Science and Tecy, 14/5/00 to 18/5/00, Brisbane. Characterisation of MCM-41 Using Regularization (2000) . Edited by Bhatia, S. and Sonwane, C.. Second Pacific Basin Conference on Adsorption Science and Tecy, 14/5/00 to 18/5/00, Brisbane. Characterization of Pore Structure of Activated Carbon by Gas and Liquid Phase Adsorption (2000) . Edited by Ding, L., Ismadji, S. and Bhatia, S.. Second Pacific Basin Conference on Adsorption Science and Tecy, 14-18 May 2000, Brisbane. Determination of Pore Size Distribution of Mesoporous Materials by Regularization (2000) . Edited by Bhatia, S. and Sonwane, C.. Access in Nanoporous Materials II, 25/5/00 to 30/5/00, Banff, Alberta, Canada. Fitted Mesh Collocation Technique for Solution for Adsorption Problems in Bidisperse (2000) . Edited by Liu, F. and Bhatia, S.. Analytical and Numerical Methods for Convection Dominated and, 1998, Bulgaria. Upgrade of stable isotoperatio mass spectrometer with continuous flow interface and analytical accessories for hydrogen isotope analysis of waters and hydrous phases. Dynamics of Adsorption in Mesoporous Materials. Percolative Fragmentation of Char Particles During Gasification.